ETS Garden Collection - Perelandra Ltd. The ETS Garden Collection is a set of five liquid solutions that were developed at Perelandra. They contain electric patterns to be used in any environment for repairing damage experienced by water, atmosphere, soil, plants and/or animals. ETS for Water, 2 oz. 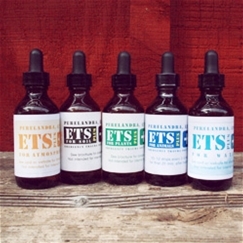 ETS for Atmosphere, 2 oz. ETS Plus for Soil, 2 oz. ETS for Plants, 2 oz. ETS for Animals, 2 oz. All of the bottles in the ETS Garden Collection are included in the Co-Creative Gardener's Kit.